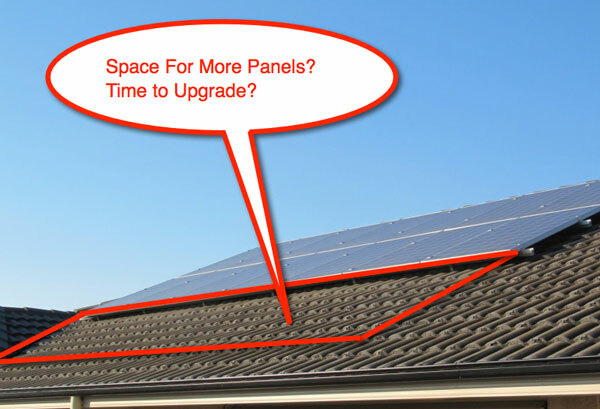 Thinking of upgrading your solar system? Up until mid 2012, by far the most popular solar power system size sold in Australia was a piddly 1.5kW. Why? Because the solar rebate at the time was twice as generous for the first 1.5kW of any system. Because of this fact Australia has the smallest average installed system size in the world! Unfortunately if you are an average Aussie household, a 1.5kW system – which produces about 6 kWh (units) of electricity per day – won’t even offset half of your electricity usage. That’s because the average Australian household consumes about 16kWh per day of electricity. The result of all this is there are many eminently sensible folks out there who have had their first taste of solar energy, like the lower electricity bills, and are now craving a bigger PV hit in the form of a solar power system upgrade! If this is you – I have good news and bad news. The cost of solar is continuing to drop, so the price you pay per extra kW should be a pleasant surprise compared to what you paid originally. If you currently enjoy a generous feed in tariff under one of the early programs, then upgrading your system may mean you forfeit it and get forced onto a lesser rate, so be careful. How to upgrade your solar whilst avoiding the traps. 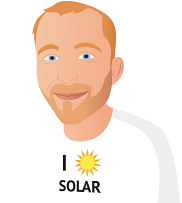 For all you solar owners who fancy supersizing your system, here is my guide to the important things you should consider when looking at upgrading your solar power system. Yes it is a bit long, but it needs to be. There are many traps you can fall in to, which are all easily avoidable by asking your solar installer the questions below. Righto let’s do this thing! Start at the beginning – what have you already got exactly? The first thing to do is establish what you have on top of your roof, how the system is performing and the condition of your equipment. If you are lucky (and the installer has done a good job) you should have a detailed system manual which described everything that was installed and the energy generation predictions. If you didn’t get this then you should call up your installer and demand one! Next time you notice it’s a beautiful cool clear, sunny day check your inverter data logger or in house display to make sure the system is generating close to its rating. Remember that solar panels are rated under Standard Test Conditions (at 25 degrees C) and all systems have some losses in cabling and inverters, so don’t expect to see 2000 Watts coming out of your 2kW inverter. As a general rule, on a great day you should be getting around 80% of the system’s rated output. If you can see historical data or have a few electricity bills handy, you can also look at the energy generated over time (kilowatt hours) and compare that to the estimates that should have been provided by the installer. Remember that you’ll generate more in summer months than winter months, so it is best to use a full year’s generation. If your solar power system is grossly underperforming, you should contact the original installer to get a system check conducted. Sometimes, simple things can go wrong (like a leaking junction box or dirt build up on the solar panels); a little maintenance can go a long way and a good installer will back up their work. A physical inspection is essential too. If you are not qualified to go on the roof and are not confident poking around with inverters, get a professional; solar power systems produce deadly voltages. If you do, and you know how to do it safely, take a good look at your equipment. Your solar panels should look almost as good as new. Look carefully for signs of corrosion under the glass, and make sure there is no sign of yellowing or browning. The white back sheet will degrade over time, but should not be showing major signs of change. Make sure the panels all look roughly consistent and with a torch, take a look underneath to see if all the cabling remains tidy, secure and hasn’t been chewed on by vermin. Next, take a look at your roof junction box or disconnect and make sure it hasn’t degraded or leaked. Where the cables enter your roof, check that the seals are still intact and flexible and that any cabling or conduit is intact. Follow this process all the way back down to your inverter. Your solar inverter is worth a quick look too. Good quality units are made of aluminium, high quality plastics or even stainless steel; lower quality units are made of steel. Check the case to see if there is any evidence of rust or other corrosion. Make sure there are no wasp nests or other vermin build up around the inverter, and that all the wiring inputs look sound and intact. If this is the case, all you need to do now is make sure you have a concise inventory of everything you have, and your latest power bills. Importantly, you should be very clear about whether your inverter can handle any expanded solar panel capacity or if you are its limit. 2. Your system has problems that need to be fixed. First port of call is your original supplier. Get them to come out correct any faults and or, honour warrantable problems; in some cases they may try to charge you but if the problems are legitimate and warrantable you should not need to pay. It might help to mention you are considering upgrading. If you approach a solar company about an upgrade, they will need to ask a number of crucial questions and should provide you with a detailed analysis of what the outcomes will be in your particular situation. Don’t be fooled into accepting an ultra-simplified quote that promises the world but fails to address the following issues. The first thing to consider is what rules apply to feed in tariffs if you upgrade, which varies depending on what feed in tariff you are signed up to and when you signed up. It’s worth noting these rules change from time to time, so it’s important to check what applies at the time you are considering your change. In some cases, if you upgrade your existing capacity and you have an FIT agreement in place, it could be jeopardised or cancelled and in other cases, it’s ok. In most cases, system size limits apply too. In some states there is a nominal maximum system size that applies (and may vary if you receive an FIT) and in others it’s entirely at the discretion of the electricity network operator what system they will let you connect. Some electricity network operators (SP Ausnet in Victoria for example) also charge a “network analysis fee” to analyse what impact your system will have on network voltage and distortion, which you may be liable for too. In some cases if your consumption changes dramatically from the addition of extra solar capacity, your electricity retailer may respond by changing your electricity rates. In simple terms, if you are worth less to them because you buy substantially less energy they may put up your rates. In some states (SA and Vic for example) some customers automatically transfer to different rates if they install solar power systems. With less value on exported energy there is now an absolute need to understand how much energy you consume at various times of the day and to compare it to what you currently and may potentially generate, should you decide to upgrade. It is vital to understand and compare when you are consuming electricity and when you will be generating electricity, to calculate an outcome. The only way to analyse this accurately is with real energy consumption data from your home which most retailers can provide (some at a small cost). Do not be fooled into accepting an “average” demand profile, unless your supplier is being very transparent about the range of potential outcomes. It’s also worth remembering the basic rules of system design that we have covered elsewhere, which should take into account things such as shading, angle, direction, energy predictions, standards, compliance, safety and so on. In some cases, new standards may also apply that require changes to your existing solar power system if you upgrade (for example, array earthing, roof top isolators and cable protection etc) depending on when your original system was installed. Key Question 8: “Please confirm in writing that you have conducted a shade analysis if required, the new design is in accordance with the Clean Energy Council and or other statutory guidelines and that the costs and impacts have been included in any outcomes”. Assuming your supplier has a good picture of what you already have, what needs upgrading and what the implications will be, the next question is what are the pros and cons of selecting different equipment for your upgrade. Solar panel sizes, models and availability change pretty rapidly, so you are likely to end up with something slightly different looking to what you have. If you can go with the same supplier and brand, its generally preferable from a simplicity and warranty perspective. Aesthetic considerations that you can control include the frame depth (for a consistent eye line on the roof) and the colour of the frame and back sheet. When it comes to the power ratings of your solar panels some important things need to be considered. If you are expanding an existing system by putting more panels in series or parallel on an existing inverter, the solar panels should be the same voltage and current ratings and your installer must confirm that the inverter is capable of handling the extra power. However, if you are adding new solar panels and new inverter capacity then you have three options. You can add a new combination of panels and inverters along side your existing system, if it’s perfectly functional, still under warranty and in good condition. There are rarely any problems putting systems in parallel, but watch out for rules about capacity limits on different phases. If you have a data logger or in home display, make sure the new system is compatible too. You can reconfigure the entire solar system and upgrade the inverter to a newer, larger unit capable of handling the combined new output. Prices have come down and features have improved, so this may be worth considering especially if you have a lower quality or old inverter. You can consider adding additional solar panels that are fitted with micro Inverters alongside your existing system. Because each panel is fitted with its own inverter, this option allows lots of flexibility, can handle different orientations and improves performance in shaded situations compared to string inverters. There is a slight price premium to pay for micro inverters but you tend to get a lot of features and flexibility for the extra dollars. What if my supplier is not around anymore? If you were unfortunate to buy from a solar company that is no longer around, then you may have to pay for some advice and design guidance. It’s harder for different companies to come in and assess others work and equipment and have to spend extra time investigating what’s required. If you have faults with your equipment, then you may need to try to get help from the ombudsman or other regulatory bodies to see if the Directors of the company can be found elsewhere and support provided. In some cases, the manufacturers may help you directly too. The big kicker from all of the above is a financial analysis. All of the above factors need to be taken into account to come up with a meaningful result; if your supplier can’t answer these questions they are not doing their job properly. With this information, they should provide you with a financial outcome that explains the payback period and the Internal Rate of Return – and what assumptions they have based this on. Above all: choose a good solar installer for your upgrade quote! Ultimately, with ever-rising electricity prices and reducing solar system prices, a solar upgrade can make a lot of sense. However, there are a number of gotchas you need to look out for. The best way to avoid them is to make sure you are dealing with the best solar installers and go through the questions above. A good installer will welcome those questions, and be prepared to back up his answers in writing. A bad one will run a mile as soon as he realises you know more about the pros and cons of upgrading solar power systems than he does!